Special Containment Procedures: Stationary Task Force Beta-8 ("Bubble Blowers") is to reside within SCP-3490 in case of unauthorized human entry. Upon the occurrence of said scenario, STF Beta-8 is required to expel the individuals responsible, and summarily administer them Class-A amnestics. Action is to be decided amongst the Task Force if any foreign objects or organisms enter. STF Beta-8 is to maintain a total of ten personnel at all times. A new member is to be chosen and sent into SCP-3490 for every death that STF Beta-8 endures. Description: SCP-3490 is a self-sustaining cumulus cloud present over the Pacific Ocean, south of the Kiribati Islands. 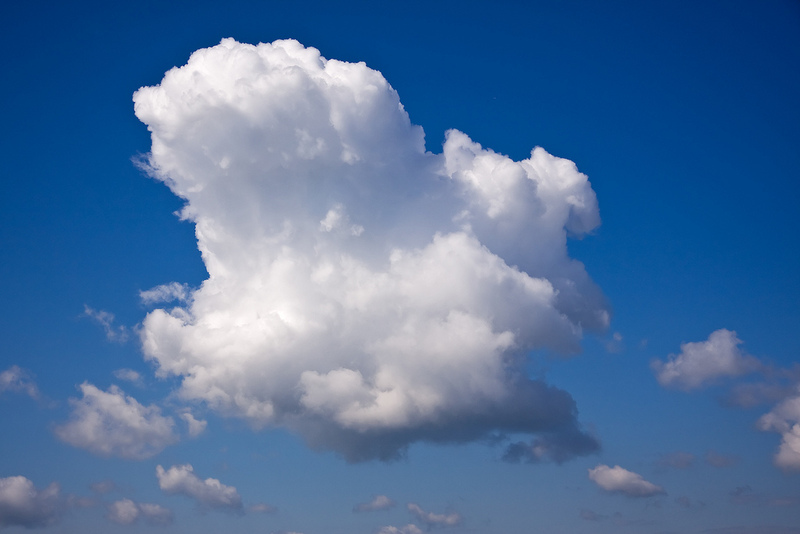 SCP-3490 behaves similarly to that of a non-anomalous cloud, often precipitating and changing shape, though it has never dissipated or left its initial location. Upon any object passing through SCP-3490, objects will encounter an open space within SCP-3490, referred to as SCP-3490-A. The barrier of SCP-3490-A's interior extends one meter from SCP-3490's surface, and is a centimeter-thick, impenetrable gelatinous substance1. In SCP-3490-A, precipitation occurs in either the form of rain, snow, sleet, or hail2, and multiple igloos coat its barrier. Gravity is also altered in SCP-3490-A, as any object is equally pulled to SCP-3490-A's barrier at any given point. Multiple humanoid entities reside in SCP-3490-A, collectively designated SCP-3490-1, that are entirely composed of water bubbles. SCP-3490-1 instances otherwise have a simple build, and do not possess facial features or other qualities common of humans. All SCP-3490-1 instances are approximately one meter tall. When an instance of SCP-3490-1 is damaged, it will regenerate from the point of contact over the course of several seconds, regardless of the injury's severity. In the case of portions of the body or even limbs being separated, both pieces regenerate into a full SCP-3490-1 instance. SCP-3490-1 instances show no sign of aging, and can only be properly terminated if all bubbles that make up their body are destroyed before regeneration can occur. SCP-3490-1 has seemingly developed its own language, culture, and religion, which is still being studied. Notably, instances are docile and social, often staying in groups. SCP-3490-1 only disperses during thunderstorms within SCP-3490-A, at which they seek shelter within the existing igloos. At 12:00 PM3 every day, SCP-3490-1 gathers at the location of a Lockheed Electra 10E plane wreck in SCP-3490-A, and remains silent for ten minutes. After this, they continue their daily activities, which includes communicating and playfully wrestling. This continues until it is 12:00 PM once again, and the cycle continues. Addendum 1: Several transmissions of unidentified origin containing descriptions of anomalous phenomena had been kept in Foundation audio storage for forty-eight years prior to the discovery of SCP-3490. Review of the transmissions has since revealed a connection to SCP-3490. These transmissions are documented in the sub-addendum below. PoI-3490-1: (Feminine) We are on the line 157 337. We will repeat this message on 6210 KCS. Wait. PoI-3490-1: Fuel is out, quickly lowering. Still on 157 337. Save our souls. Quickly lowering. Hold transmission. PoI-3490-1: L-Land is visible. Lots of turbulence. PoI-3490-1: Control lost, straight down! Straight down! PoI-3490-1: We crashed at 8:47. Noonan died. I still don't know where I am, or what this place is. We dived through a cloud, and then… are we in it? Were we brought somewhere? I'm so confused. I briefly saw afterward, we were heading right into this wall. I ducked under the controls, on impulse. I guess I passed out then, woke up an hour later. My head really hurts, but I'm fine. PoI-3490-1: The plane was barely damaged. It kinda just… bounced off. I think. I think Noonan w-was knocked around a lot… poor guy. I can't really give him a proper burial, a proper anything. I just wrapped him in a blanket, it was the most I could really do. It's raining out there, I'm sure he wouldn't want to sit out there, y'know. Sorry, I'm rambling, just… if this is coming through for you, please help. I don't know how, just… try. PoI-3490-1: … I-I guess I'll take a look around now. PoI-3490-1: I was able to walk all the way around this place. I mean, I'm inside of this large shape, and I was able to walk all the way around the edge, and I never fell! I still don't know where this is, but I'm still believing that… this is in a cloud. I'm in a cloud! These little people are adorable too, so friendly. They live in these small ice huts. They love to wrestle. PoI-3490-1: … T-They're calling for me. This is amazing. PoI-3490-1: Keep trying to find me, if you haven't been already. I don't know if this is transmitting at all, I don't know why I believe it is. I just want to talk to someone about this. Maybe Noonan. Anybody. But I'm alone. PoI-3490-1: I have maybe a days worth of food. I'll try to ration it as best I can. If I do it well enough, I'll have four weeks. Four weeks. PoI-3490-1: That's terrifying to think about. I always assumed I might die in a crash, and I accepted that. But, hunger… I'm sure that isn't fun. But you'll find me by then, I'm sure. Right now I don't want to think otherwise. PoI-3490-1: … Uh, anyways, I've… somewhat gotten used to being here. It's fun going about with the bubble people, it keeps my mind off things. They're still just as curious about me as I am about them, and it's just… I don't know if it's right to say that I love it here, but that's exactly how I feel. They've made me feel at home. PoI-3490-1: (Giggles) … Hungry already. PoI-3490-1: These people seem to have their own hardships as well. Every now and then, one of their huts will get caught in between part of the cloud, and as it moves, the hut is crushed. If that slime can break down solid ice, then there's no way I'm getting through it. I still might not ever get out of here, even if you do find me. PoI-3490-1: I saved it. So, one of the huts was stuck in the cloud again, and I guess it was still in the hut, and its leg got stuck. I ran over as quick as I could, and I tried pulling the slime off of it, but it was only getting worse. I kept pulling and pulling as much as I could, and I tore it in half! I was so worried and I didn't know what to do, but it actually seemed happy. It started growing and before you knew it, it was whole again! Most of them picked the little guy up and carried him around, and the ones that weren't were jumping around me. I glanced back at where he was stuck, but the cloud had already folded over. I don't know why this doesn't feel weird to me. Why does it make so much sense? PoI-3490-1: Now that I think about it, some of the people were already walking away. Why didn't they care? Was it… normal to them? I hope this doesn't always happen. PoI-3490-1: I'm feeling a little weaker, sleeping a little longer. I just… I have that feeling you get, when everything is fine, but you just don't feel right. It's happening to me a lot now, coming on and off. I've just gotten so sick of water, I want to vomit just feeling it in my mouth. I don't know why I'm having so much trouble, but I'm just so hungry, and it makes me so irritated. It makes me so hopeless. You're looking for me, right? Search every cloud you can find around Howland Island. Please do it, no matter how ridiculous it sounds. PoI-3490-1: N-No, I won't cry. PoI-3490-1: Sorry I haven't transmitted recently, I'm fine. I think it's been two days but I have no way of knowing. PoI-3490-1: Only a day ago I couldn't bear Noonan's… stench. I've grown use to it though, I've been sitting in the plane for a while now. The bubbles come and visit me from time to time. I think they can tell I'm hungry. They keep bringing me ice in all sorts of shapes. It's helping for now. PoI-3490-1: Yea, I don't know what else to say. PoI-3490-1: Rations are out. Can only go downhill from here. PoI-3490-1: I, uh… I've had a lot of time to think. I want to die accomplishing something. Here. So, I have an idea. I know how to make it safer for the bubbles. In case they ever get stuck in their huts again, I'll teach them to build it with ice blocks for the flooring. It'll be harder to break, and it may give them more of an opportunity to get out. PoI-3490-1: I'm practically skin and bones. My legs wobble when I stand, but I have to try. PoI-3490-1: Guys, it's… nevermind, please, help me up. PoI-3490-1: I don't even have the will to explain it, b-but I got it through to them. They're building floors in all of the igloos now. I'm so happy for them. PoI-3490-1: … T-T-This… will be… my last t-transmission. I love you a-all. I love you world. I love y-y-you mama. I'm s-so s-sorry. PoI-3490-1: I-It's been worth it, being here. If you can hear me, then thank you for searching, t-thank you for trying, and I hope you don't blame it on yourself. I'm h-happy. If you can't… h-hear this, perhaps that's best. PoI-3490-1: (Giggles) H-Hey, at least I can say I've gone where no man has gone before. Where no woman has gone before. I've done something that might n-never be done again. I thank you all for this opportunity. Thank you for giving this to me. T-This is Amelia Earhart, signing off. G-G-Goodbye now! Good… bye now. B-Bye, now. 1. This makes it unclear how objects initially enter SCP-3490-A. 2. This precipitation always originates from SCP-3490's center of mass, and proportionately detracts from SCP-3490's size with the amount of precipitation.